Luis Enrique was unhappy at the abuse his players received against Leganes. Luis Enrique: "As a fan, booing a player of your own team for me makes no sense." 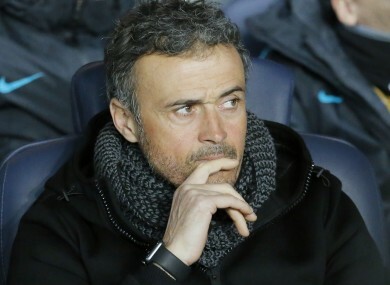 BARCELONA BOSS LUIS Enrique labelled harsh treatment dished out to his players by Barca fans nonsensical as the Spanish champions squeezed past Leganes 2-1 on Sunday. Following a 4-0 thrashing at the hands of Paris Saint-Germain in midweek, Barca needed a last-minute Lionel Messi penalty to see off a Leganes side without a win since November and on their first-ever league visit to the Camp Nou. Messi had given Barca a fourth minute lead, but jeers rang around the Camp Nou when Unai Lopez levelled 19 minutes from time. “As a fan, booing a player of your own team for me makes no sense,” said Enrique. Much-criticised midfielder Andre Gomes received the brunt of the boos as he was replaced 10 minutes from the end. “What can clearly help the team and the players is the support that we saw from the majority of the fans throughout the game and especially in the final minutes,” added Enrique. However, the Barca boss said he had no such problem with criticism directed his way. “I am the coach and after the result and performance we saw in Paris it is logical. I accept any criticism, but those on the pitch need to be in the best state possible. Victory ensured Barca moved back up to second in the table and to within a point of Real Madrid, who still have two games in hand. Barca face a much stiffer test next weekend when they travel to Atletico Madrid, but Enrique highlighted the psychological importance of getting the three points despite a poor display. A slip-up today would have been almost definitive. Not in terms of points, but on an emotional level. The Spanish champions were thankful to a series of fine saves from Marc-Andre ter Stegen as he was unexpectedly busy to keep Leganes at bay. “It has been a difficult week for everyone without a doubt,” said the German. And Ter Stegen echoed his coach’s call for a show of unity from the Barcelona faithful. “Everyone that is on the field tried their best and I think the most important thing is to support us at times like we have had this week with the 4-0 defeat in Paris,” he added. “We need the fans, above all at home, to support us. Email “'Andre's case annoys me' - Barca boss defends under-fire midfielder and hits out at boos”. Feedback on “'Andre's case annoys me' - Barca boss defends under-fire midfielder and hits out at boos”.